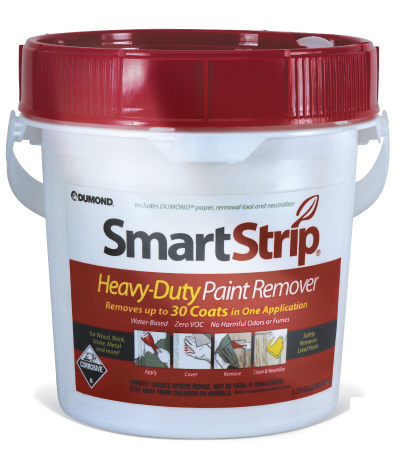 The Smart Strip 1 HD system is an environmentally safe system for removing up to 30 coats of paint in a single application from most surfaces, (i.e., wood, brick, concrete, stone, stucco, plaster, cast iron, steel, marble, and fiber-glass). The system includes an alkaline paste that is spread or airless sprayed over the surface to be stripped. The paste is then covered with Dumond Laminated Paper to control evaporation. Allow paste to dwell on the coatings until the coatings are dissolved. After appropriate dwell time, the paste and softened paint can be removed onto the paper. Any remaining residue can be removed with water. Finally, the stripped surface must be neutralized using Citri-Lize™. Smart Strip 1 HD is excellent for stripping paint from intricate, carved, or molded surfaces, and is considered the best paint remover for historic restorations and other projects involving lead-based paint. Water based, no harmful fumes, odour free and zero volatile organic compounds (VOC). Recommended application: 3-6 mm (depending of number of coats). Dumond Smart Strip™ is a revolutionary, odour free paint remover that is safe for the user, the substrate and the environment. This 100% biodegradable, water-based paint stripper is extremely effective for removing multiple layers of architectural and industrial coatings from virtually all interior/ exterior surfaces such as wood, brick, metal, concrete, stone, plaster, fi berglass, etc. Smart Strip does not contain methylene chloride, any caustics, or toxic chemicals. Smart Strip™ is exceptional for lead-based paint removal and it is excellent for intricate, carved, or molded surfaces. The product is also exceptional for removal of marine coatings. Because it is a paste, it is easily applied by brush, roller, or conventional airless spray. It is formulated to remain wet and effective over extended periods of time and does not require the use of Dumond Laminated® Paper, although the use of Dumond Laminated Paper will accele-rate the process and increase the dwell time. Dumond Laminated Paper may be necessary to increase the dwell time especially in connection with lead abatement and industrial projects. Releases no harmful vapors, contains no volatile organic compounds (VOC) and is pH neutral. 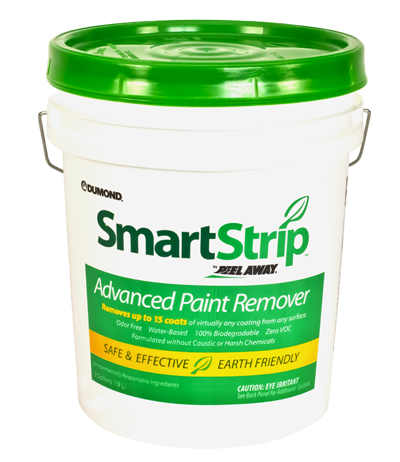 Smart Strip™ PRO is a professional strength paint remover that effectively removes high performance coatings and lead paint. It is formulated without methylene chloride and is non-carcinogenic, non-caustic and non-flammable. This water-based stripper will effectively remove multiple coats of oil-based, acrylics, varnishes, epoxies, urethanes, ela-stomerics and lead paint from any interior or exterior surface (wood, brick, stone, concrete, plaster, metal, plastic, glass, fiberglass, etc.). Smart Strip™ PRO delivers the superior performance professionals are looking for when removing even the most difficult coatings. This product is low VOC, low odour, biodegradable and user friendly. Dumond Laminated Paper can be used to accelerate the process and extend the dwell time. The use of Dumond Laminated Paper can be necessary to extend the dwell time, especially in connection with lead abatement and industrial projects. Recommended application: 3-6 mm (according to number of layers). One superb product for all porous, non-painted surfaces! Removing graffiti from brick, concrete, and other porous surfaces is a safe and easy process with Wipe Out®. As a fast acting, effective, and biodegradable graffiti removal and cleaning product, Wipe Out® is designed to safely remove heavy graffiti from all non-painted, porous surfaces such as brick, mortar, cement, stucco, and pavers as well as natural stone surfaces such as granite, marble, sandstone or brownstone. In less than 30 minutes, Wipe Out® clings to the spray painted surface and works to remove the graffiti fast. This specially formulated graffiti removal product has the ability to draw out sprayed-on paint from within the smallest surface pores without creating the shadowing effect that many competing products leave behind.